I was so happy at Busan! Doesn't mean that i am not happy at other place. But i think i really really really enjoyed Busan even though i didn't spend much time there. 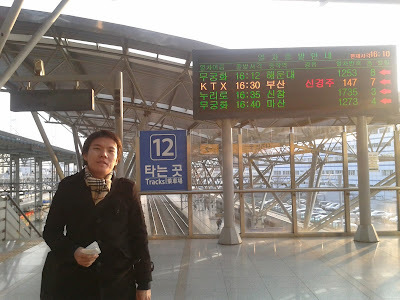 Went to Busan by KTX - Korea Train Express ! 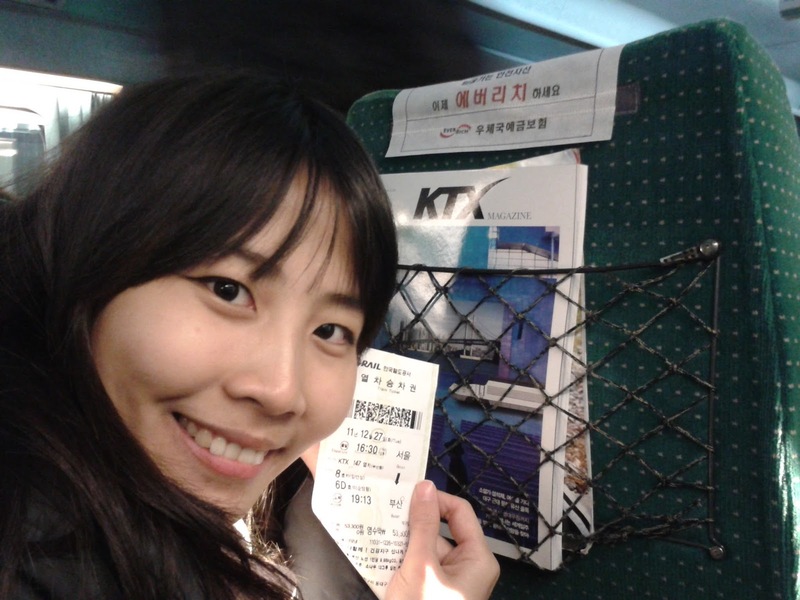 Our first time using KTX ! We departed from Seoul Station 서울역! KTX 16.30 Seoul - Busan ! Saw this sad but very beautiful scene which made me cry as well. An army and his girlfriend who's saying goodbye to each other through the window of the train. We ate lunch box 도시락 inside the train! Using KTX feels like using airplanes! Comfortable, clean, fast as well, got cabin crews too, and foods are pretty and quite nice too! See! The food looks so nice leh! And taste nice too.. Somehow i think it's so nice to have banchan. So it feels like having many options of food for you to eat. and... also should wash many plates lah! hahahha. Arrived at Busan! It took us around 2,5 hours. Went to Gwangalli Beach 광안리 and had dinner around that area.. The food i had that night is like... one of the most delicious foods i have ever had in my life. It's fish sashimi!! If come to Busan, then should eat seafood. But.. oppa really like to eat fish and somehow i kinda not to not liking fish anymore.. So.... i miss fish, i miss fish.. I even admit to my grandpa that now i like fish and i want fish. My grandpa said that later when i go back home, he will buy fish and ask grandma to cook fish everyday for me. hahaha.. My grandpa is actually very cute and kind though he seldom can show it. Very delicious!!! This is the one i made for oppa. For mine, i don't want silk worm. I have ever tried it... It's somehow.. quite weird for me. I can eat it but i don't really like it. The next day, we were going to meet people at Haeundae Beach 해운대 area.. So.. here we are, Haeundae Beach ! So cute. The kid's giving foods to birds ! I am also cute here anyway. hahaha! Then we went back to Seoul..
Until we meet again, Busan ! hello, i'm cherry, here to ask you questions again. i'll be going to busan during may 20th. do you know how the weather is like then? i hope i just need to wear t shirt and cardigan, cause i'm scared of cold! I myself never been to Korea at May. So i don't really know. I think it might not be too cold because supposedly it is going to be summer. From my experience, Busan is warmer than Seoul. Maybe just bring a jacket just in case. And i went to hot spring (public bath) inside the hotel i stayed in at night. Not much i did but don't know why i love Busan so much. Maybe the sashimi i ate was delicious and because i love beach. At night when i was sleeping, i heard a loud noise like clubbing place i guess. So i think that Busan has night life entertainment (if you like).